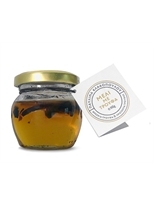 The honey from Greece is considered to be some of the finest honey in the world. Variables such as unlimited summer sun, the biodiversity of the Greek countryside plus the rich variety of Greek flora which includes over 850 species found nowhere else in the world! When enriched with truffle, we get a truly magnificent product that combines two of the rarest and most precious taste of the world.